Civilizations may be built on the sweaty backs of the workers, but they stick around through shrewd management at the top. You may be in command of the chariot of your civilization, but the the wheels of your victory will spin faster with the right foremen and -women in place. Micromanaging is what your workers need. 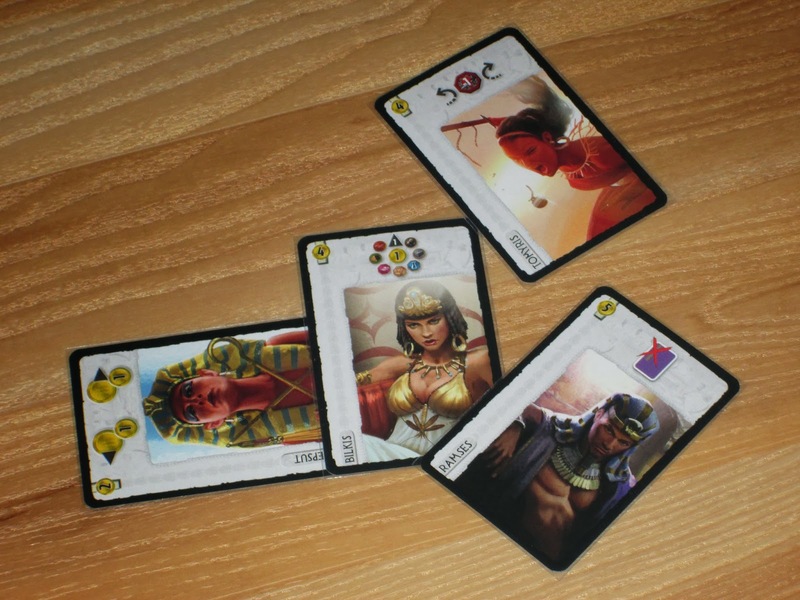 Leaders is an expansion for 7 Wonders. The base game rules are still in effect, but Leaders adds a few twists. For starters, it adds a deck of leader cards to the game. At the beginning of the game, before Age I cards are distributed, there is a leader draft. Each player receives a hand of four leader cards, chooses one, and passes the rest to the right. This continues until each player has four leader cards. Each player starts with six coins instead of three. These leaders aid a military strategy. 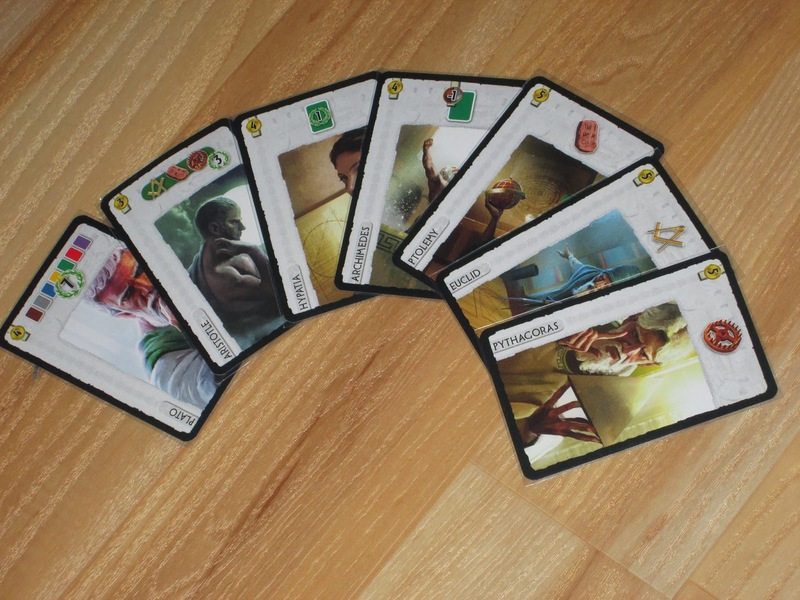 At the start of each age, before regular age cards are distributed, each player chooses one of their leader cards to play. These cards can be played in the usual ways–face up for their benefit, face down as part of a wonder, or discarded for coins. The cost of leader cards is always paid in coins. 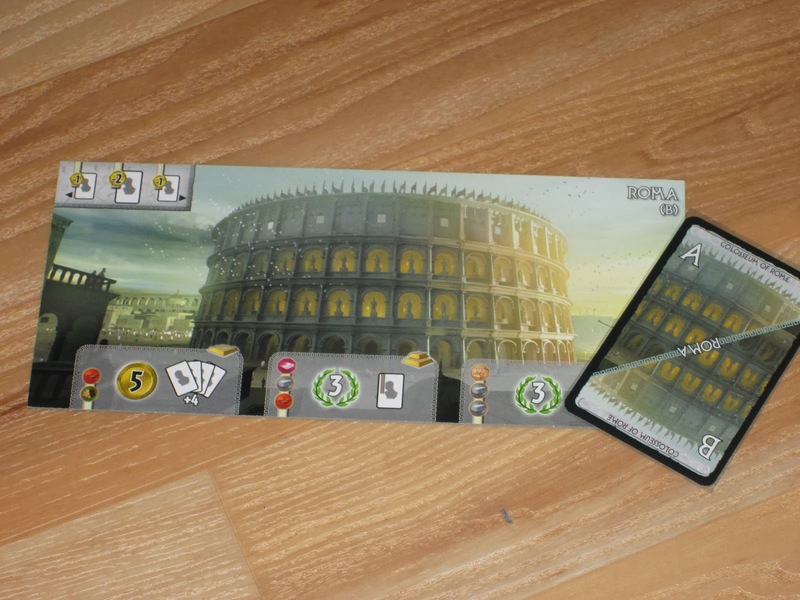 The game also comes with a new wonder, Rome, whose owner can play leaders for free or for a reduced cost, depending on which wonder side is used. Ave Caesar, or Et Tu, Brute? 7 Wonders is, generally, a game of tactics. Each wonder board has a unique advantage in some area, but whether players can exploit that advantage depends very much on what other players pass them. It does no good to have Babylon’s science bonus if no science cards make their way into the Babylonian coffers. Players must work to make their own luck to earn the precious victory points that the ancients cared so much about, but much of this is done on the fly. Leaders, the first expansion for 7 Wonders, pushes the game in a more strategic direction by allowing players to draft additional asymmetrical benefits at the start of the game. It makes the expansion better suited for hobbyists, which, depending on your group, may be good or bad. 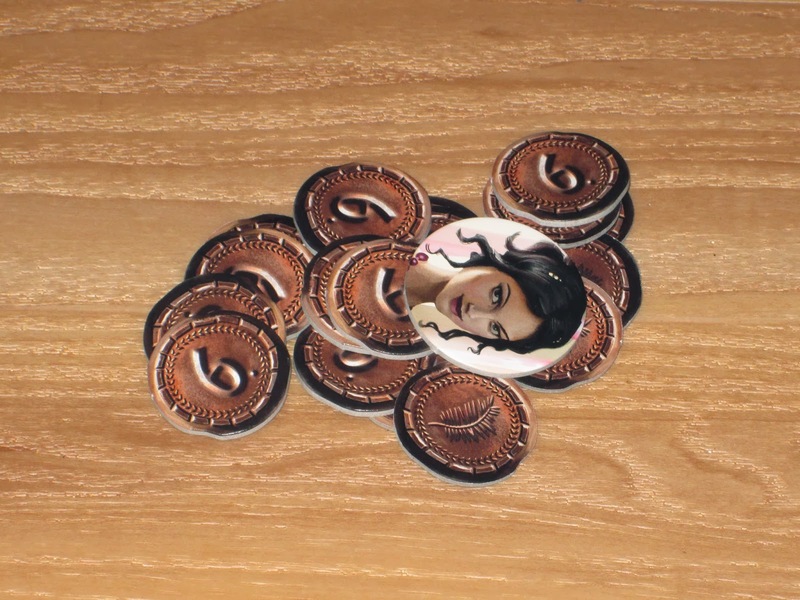 The new tokens included in Leaders. First, a word on the components. Leaders includes thirty-six leader cards, four guild cards, a new wonder board, new coin tokens (worth 6 each), and a courtesan token (used with the courtesan’s guild card). 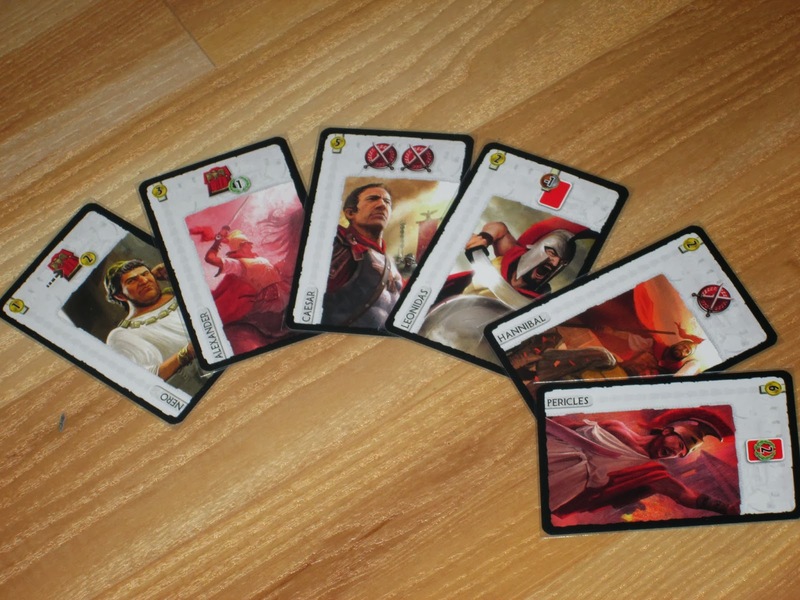 The expansion also comes with a new scorepad to account for the leader cards at the end of the game. The components are excellent and match the base game in terms of quality (both art and tactile nature). The expansion retails for $30, which may seem high for what comes in the box. Depending on what you’re looking for, the cost might still be worth it. I really like the Leaders expansion. It’s thrilling to try to cobble a long-term strategy together based upon which leaders you see and to do this before any cards are played. This draft, like the drafts in the three ages of the game, is very tactical as well, since players will not see their leader hands again (if playing with 4+ players) and since not every leader will be included in the game. The leader cards are similar to the guild cards in that there is a pool of potential cards available, but it is impossible to know which ones will appear in any given game. This may bother players who are fond of the complete balance of the base game. I don’t mind it too much. Though the draft is tactical, it gives players, like the wonder boards, a goal to reach for in the game. I don’t think this is a bad thing. I also like the variety of abilities that are available for the leaders. Some give extra science symbols, some give bonus coin kickbacks or discounts, some offer added military strength, some make sets of cards more valuable, and some allow a player to build cards for free or at a discount. I like that there is a broad range of effects because it keeps the game interesting and also makes some strategies more viable than they may otherwise seem. Of course, the wide variety of new abilities also means new icons to memorize, which can seem overwhelming for new players or players who are inexperienced with all the icons in the base game. Leaders also includes a new wonder, Rome. Rome’s “starting resource” is it plays leaders for free (side A) or offers a discount on leaders (as well as a discount for its neighbors). Rome is a fantastic addition to the game, although because its abilities and resources tie directly to the leader cards, it can only be used if playing with the Leaders expansion. Rome requires a different strategy, as it (like its ancient predecessor) is resource poor but rich in leaders. Rome allows its owner to add more leaders to his or her hand and to play more leaders during the game. But the trade-off is not harmless, especially at the start of the game: Rome has no resources. I’ve found the wonder to be balanced during most games, though the other players at the table have sometimes disagreed. Some recognizable names. Watch out for Vitruvius. My friend calls him “useless” (I don’t judge him so). Some players I’ve introduced Leaders to haven’t liked that the draft at the beginning of the game is such a crapshoot. They feel that some leaders are obviously overpowered, and some players are better able to draft based on the cards they receive. One of the tricky things about the leader draft is that it’s very difficult to take cards that other players want merely to prevent them from having them. The reason is that, unlike the drafts during the game, players do not play their leaders immediately–instead, they play one leader card per age. And since it’s impossible for other players to know what the initial draft hand looks like, it’s nearly impossible to know which cards will be attractive to your neighbor. I don’t mind this, especially given that there are enough general purpose leaders to fit any strategy, but it’s worth mentioning. I like Leaders quite a bit for what it adds to the game, but it’s an expansion that will have limited utility for novice players or people who are frequently playing with novices. Leaders doesn’t add much to change the flow of the game (the game still feels like 7 Wonders), but it makes the game feel much more complex. As I mentioned, there are more icons to learn, there’s another step in each age, players start with more coins–more, more, more. The scores are generally higher in Leaders, and if players mess up the leader draft at the beginning of the game, it can add to a large score disparity in the end-game, especially if one or more of the drafted leaders turns out to be useless; there is little margin for error. This usually isn’t a problem for experienced players, but that’s just it: Leaders works best with experienced players. It’s not an expansion that is friendly or forgiving to new players. Even the base game, with the guilds and special yellow scoring cards in Age III, allows players to come back and make up for gaps in their gameplay in the prior ages (at least in some ways). It’s much harder to come back when using Leaders. The new icons can trip up particularly new players. Similarly, the number of new icons in the game is also not insignificant. The base game plays easily enough once players get familiar with it, but that usually takes 2/3 of the first game at least. Another game or so allows players to catch on to some of the subtlety of strategy, and if these games are played in close succession, players will feel comfortable and familiar enough with the base icons to add new ones. The Leaders cards, however, are often too much for new or even casually familiar players. They change the game enough to obscure some of the finer points of strategy. Leaders is a very good expansion, but it’s not one I integrate often. The reason is that I usually have new or unfamiliar players at the table, and Leaders is simply too much to throw at them. 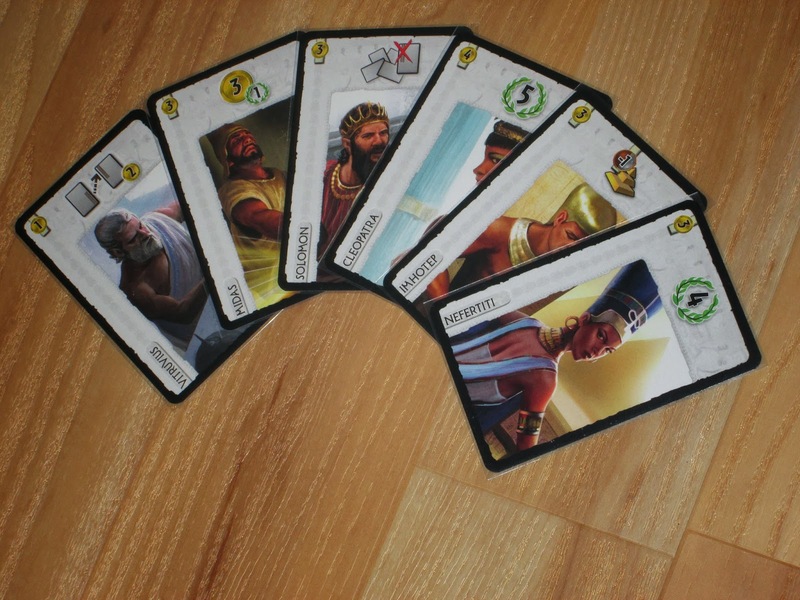 7 Wonders is a fairly simple game (at least once learned), enough so that when it won the Kennerspiel des Jahres, many were saying it should have been in the Spiel des Jahres category instead. (I believed so when the awards were announced; I’ve since changed my opinion on that.) Leaders definitely pushes the game outside its initial simplicity to become a game that is much more for hobbyists. It works best with players who are familiar enough with the base game to know how to draft a good hand of leaders and who won’t have to continually ask what the icons mean. In other words, it works best with a consistent game group who is willing to go deep with the game. So I’m torn in my recommendation for Leaders. For me personally, I like it a lot, at least when played with others who are on a fairly even experience and familiarity level. For me as a game explainer and introducer, it rarely makes it out of the box. 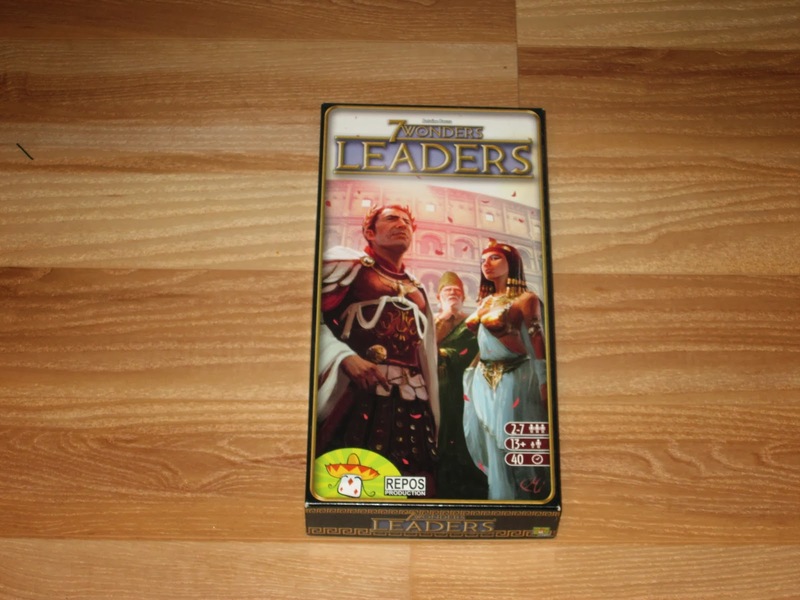 If you or your group plays 7 Wonders often with people who are familiar (or perhaps even bored) with the game, Leaders is an ideal next step to keep the game interesting. If you (like me) are often introducing (or reteaching) 7 Wonders, you won’t get much mileage out of Leaders. And really, that’s okay: the base game has mileage enough in it to sustain gameplay for most groups. Leaders is a nice, albeit inessential, expansion to 7 Wonders–one I like to integrate when the situation merits it, but one I don’t mind setting aside if it gets more players to the table. I think that leaders is a fantastic addition to 7 Wonders but agree that it should not even be attempted with more casual players (which unfortunately seems to include family). Cities is certainly much easier to teach and integrate but I think that Leaders has a much more profound impact on the game. One of the main things that I like about Leaders that I don’t believe you mentioned is giving you something to spend your money on. I’ve found the base game, and even Cities, to be a bit feast or famine as far as money goes. Leaders does a good job of giving you some tough choices for how to spend your money to keep things tight all game long. Cities does this too and really I think the two should be played together to really get the full affect of this tension. That’s a very good point, which you’re right: I didn’t note. The economy changes quite a bit in Leaders. It’s not just that you start with extra coins; it’s that you need more of them on hand. And, as you say in your comment on the Cities review, that’s probably why the two expansions work extremely well together: they both make the economic decisions in the game more interesting.